All Times: Arrange schedule with student. 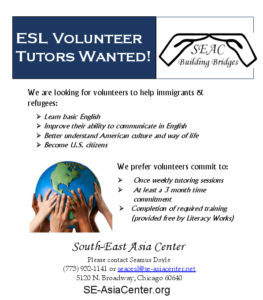 SEAC volunteers receive twelve hours of ESL and cultural orientation training and are matched with students based on personality, interest, and scheduling compatibility. Most volunteers tutor two to four hours a week. We prefer a three-month commitment to give your student some continuity. For more information contact the Broadway office.